Having warded off two consecutive ground attacks on the city, the defenders of Warsaw were now suddenly given a very welcome respite due to unexpected developments that were unfolding 100 kilometres west of the capital. That evening, September 9, the Poznan Army under Lieutenant-General Tadeusz Kutrzeba and the Pomorze Army under Lieutenant-General Wladyslaw Bortnowski launched a very strong surprise counter-attack against the left flank of the Heeresgruppe Süd forces advancing towards Warsaw. With the two German pincers moving north and south of him, Kutrzeba’s army had until then been largely unaffected by the fighting and was still completely intact. As it moved back eastwards from Poznan, German army intelligence had somehow lost track of it and mistakenly assumed it had already pulled back behind the Vistula. Joining up with Bortnowski’s Pomorze Army, Kutrzeba saw a chance to strike at the northern flank of the German southern pincer. The Polish High Command initially turned down his proposal, ordering him to continue withdrawing to the Vistula, but early on the 8th he was given the green light. It was a desperate manoeuvre to stall the German advance and buy time for the organisation of Warsaw’s defence. The attack, by eight infantry divisions and two cavalry brigades, fell on the 30. Infanterie-Division of Blaskowitz’s 8. Armee, which was holding a thin screening line along the Bzura river. The Poles inflicted considerable losses on the Germans, killing 1,500 and capturing 3,000 in the initial push. To avoid a serious reverse, Blaskowitz was compelled to completely suspend his army’s advance on Warsaw and divert all his troops to come to the rescue of the 30. Division. Nonetheless, the Germans were thrown back southwards some 20 kilometres. Von Rundstedt and his Chief-of-Staff Generalleutnant Erich von Manstein initially underestimated the Polish advance and judged it a problem the 8. Army should solve by itself. However, on 11 September, realising they had a major crisis on their hands, they changed their mind and decided to redirect the main force of the 10. Armee plus army group reserves and most of the aircraft from Luftflotte 4 towards the Bzura. Thus reinforced, the Germans managed to hold the Poles in a vicious battle on a narrow front along the river. Raging for a full ten days, it developed into the largest, longest and single most-important battle of the campaign. However, as a direct result of this Polish counter-offensive, the 4. Panzer-Division and the Leibstandarte-SS were withdrawn from Warsaw and sent westward to help stave off the threat. Their positions were taken over by the 31. Infanterie-Division (Generalleutnant Rudolf Kämpfe), one of the follow-up divisions of the XVI. Armeekorps, the lead regiment of which – Infanterie-Regiment 82 – arrived in front of Warsaw on the 11th. Its troops were fatigued by long days of marching in hot weather and already weakened by earlier battles, so they were ordered for the time being to refrain from a direct attack on the city and just maintain siege positions. In this sense the attempt to buy time for Warsaw was a success. However, the aerial attacks on the city continued. On September 10, nicknamed `Bloody Sunday’, there were more than 70 German bombers above Warsaw and 17 consecutive bombing raids. Meanwhile, there had been an organisational change on the Polish side. On September 8, the day of the first German assault, Marshal Smigly-Rydz had ordered the creation of an improvised Warsaw Army (Armia Warszawa) under Lieutenant-General Juliusz Rommel. Until then the commander of the Lodz Army on the border, Rommel had got separated from his operational forces and had just arrived in Warsaw with his staff (some critics say he more or less abandoned his army and defected to the capital). From his headquarters at Brest-Litovsk, Smigly-Rydz sent him a signed order to `defend the city as long as ammunition and food lasts, to hold as many of the enemy forces as possible’. The newly-created army was composed of the forces defending Warsaw (under General Czuma); the garrison of Modlin Fortress – a 19th-century citadel located at the junction of the Vistula and the Narew rivers some 30 kilometres north of the capital and blocking a main approach to it (under Brigadier-General Wiktor Thommée) – as well as all Polish units defending the Narew and Vistula riverlines north-east and south of Warsaw. General Czuma continued as the commander of the Warsaw Defence Force, which he split into two sectors, one on each side of the Vistula: East (Praga) under LieutenantColonel Julian Janowski and West under Colonel Marian Porwit. Meanwhile, the defenders of the city were joined by various units of the routed Prusy Army, notably the 44th Infantry Division (Colonel Eugeniusz Zongollowicz), a half-complete reserve formation made up of regiments of the Border Defence Corps (Korpus Ochrony Pogranicza – KOP), which had been dispersed by the 1. Panzer-Division at Belchatow and had been ordered to head to Warsaw. Other stray units came from the defeated Lodz Army, notably the 4th Battalion of the 30th Infantry Regiment from the 10th Division under Major Bronislaw Kaminski, which arrived on the 10th and took up defensive positions in Plackowka and Mlociny in north-western Warsaw. In addition, several new units were created in the capital itself out of reserve centres of two Warsaw-based formations. Reservists from the 8th Infantry Division formed the 360th Regiment under Lieutenant-Colonel Jakub Chmura. It comprised five battalions which would be deployed at various points in the city’s defensive lines. The rear-echelon battalion of the 36th `Academic Legion’ Infantry Regiment, a unit made up mostly of university students, served as a core of the 336th Regiment. Split onto two separate units, the 1st and 2nd `Defenders of Praga’ Regiments under Colonels Stanislaw Milian and Stefan Kotowski respectively, it helped defend the Praga sector on the east bank of the Vistula. During all this time, Stefan Starzynski, the Civilian Commissar of Warsaw, was a tower of strength in the besieged city. His daily radio speeches were crucial in keeping the morale of both soldiers and civilians high. Starzynski commanded the distribution of food, water and supplies as well as the firefighting brigades. Assisted by his Deputy, Julian Kulski, he also managed to organise shelter for almost all civilian refugees from other parts of Poland and for people whose houses had been destroyed by German bombing. Meanwhile a new threat to Warsaw was developing from the north-east, this time coming from Heeresgruppe Nord. On September 10, von Küchler’s 3. Armee had broken through the Polish lines along the Narew river and started its march southwards, aiming to cut off Warsaw from the east. Its I. Armeekorps under Generalleutnant Walter Petzel crossed the Bug at Wyszkow on the 11th and was now rapidly approaching the capital. As this new menace got near, the city’s garrison again received welcome reinforcements in the form of units from the Modlin Army pushed back by the German advance. The remnants of the 5th Infantry Division under Major-General Juliusz Zulauf reached Warsaw on the 14th, re-uniting with the division’s own 40th `Children of Lwow’ Regiment. With Zulauf’s force came the 21st `Children of Warsaw’ Regiment, commanded by Colonel Stanislaw Sosabowski (of later Battle of Arnhem fame), which had got separated from its parent 8th Division on the third day of the invasion and had fought its way back from the north by itself. The battered remains of the 20th Infantry Division under Colonel Wilhelm Andrzej Lawisz. Liszka arrived from Mlawa on the 15th. All new arrivals were incorporated into the Warsaw Army and assigned to the defence of Praga on the east bank, General Zulauf taking over command of the East sector from Lieutenant-Colonel Janowski. They had just made it in time for on that same day – September 15 – the 61. Infanterie-Division (Generalleutnant Siegfried Hänicke), leading element of the I. Armeekorps, reached the eastern outskirts of Warsaw. The Germans must have been unaware of the exact Polish positions in this part of the city, for a large column of troops came marching into Grochow, the south-eastern working-class borough of Praga, along Aleja Jerzego Waszyngtona (Washington Avenue), straight at the positions of Sosabowski’s 21st Regiment. His 1st Battalion opened up a hurricane of fire that took the enemy column completely by surprise. Stalled, the Germans tried to deploy into assault formations, bringing direct artillery fire and tanks to bear. Polish anti-tank guns positioned down the avenue knocked out two of the panzers but the Germans nonetheless managed to gain a foothold in eastern Grochow, wiping out a platoon of Polish riflemen that was covering the withdrawal of their company. However, the German advance was held at the next street and by 7 p. m. the attack had been repulsed. Sosabowski’s command tallied a loss of 320 men killed, wounded or missing. The following day, September 16, another three of Küchler’s infantry divisions arrived at the eastern gates of Warsaw: the 11. Infanterie-Division (Generalleutnant Max Bock), the 32. Infanterie-Division (Generalleutnant Nikolaus von Falkenhorst) and the 217. Infanterie-Division (Generalmajor Richard Baltzer), the latter two both of the II. Armeekorps. Together with the 61. Division, they now formed an unbreakable cordon around Warsaw east of the Vistula. With the 31. Division of the 8. Armee enclosing much of the city on its western side, only a broad strip of land along the Vistula towards the Kampinos Forest in the north-west and the Modlin Fortress in the north now remained in Polish hands. Though not yet completely encircled, Warsaw was effectively under siege. That morning, Sosabowski’s men were surprised to see an open car flying a large white flag, followed by two tanks with the crews standing up in the open turret, slowly coming down Washington Avenue towards the barricade on Grochow Street. It was a party of truce. The German parliamentaire, Major Kiewitz, commander of the I. Bataillon of Infanterie-Regiment 151 of the 61. Division, handed Sosabowski a letter addressed `to the Officer Commanding Warsaw’ and containing a demand for the surrender of the city. Sosabowski sent the note to General Rommel’s headquarters and within an hour the answer came back that the Army Commander would neither talk with, nor see, the enemy emissary. Within two hours after Major Kiewitz returned to his lines, a furious artillery bombardment fell on the Polish positions. An hour later, at 5 p. m., the 11. Infanterie-Division launched an assault against Sosabowski’s regiment. Again, the Poles waited until the attackers had approached within 100 metres of their positions before opening a withering fire with rifles, machine guns and mortars. After three hours of bitter fighting, the assault was repulsed with heavy losses to the Germans, the attacking unit – Infanterie-Regiment 23 commanded by Oberst Johann-Georg Richert – being practically annihilated. A similar thing happened when Infanterie-Regiment 96 of the 32. Division attempted to enter Brodno in northern Praga. It was met with intense artillery and mortar fire and thrown back with heavy casualties, losing 150 men. Meanwhile the battle for Poland was continuing. 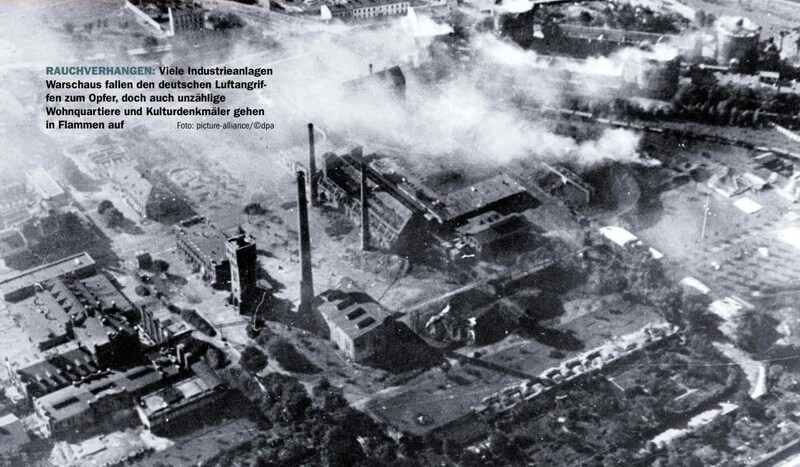 Well to the east of Warsaw, on Heeresgruppe Nord’s far left wing, von Kluge’s 4. Armee was speedily moving south. Its XIX. Armeekorps, under General der Panzertruppe Heinz Guderian, dashing forward far in advance of the infantry formations, had crossed the Narew at Wizna and, moving on east of the Bug, reached BrestLitovsk on September 14, capturing the citadel on the 16th. Then, on September 17, Poland received a further shock when the Soviet Red Army, following the secret protocol of the German-Russian non-aggression pact signed in Moscow just three weeks earlier (August 23), entered the country from the east. With the Poles having no forces other than border guard troops to oppose this move, and many of these initially even being uncertain over whether to welcome or fight the new invaders, the Soviets rapidly occupied eastern Poland. Now under attack from all sides by two different countries, Poland was fighting a losing battle. Realising that defence had become impossible, Marshal Smigly-Rydz issued orders for all Polish forces to retreat towards Romania and avoid fighting the Soviet aggressors. The Polish government and High Command crossed into Romania, where they were interned. On September 18 Guderian’s panzer corps made contact with armoured units of the 14. Armee of Heeresgruppe Süd at Wlodawa on the Bug river, 200 kilometres south-east of Warsaw, thus completing the planned giant pincer movement and the encirclement of virtually all Polish forces. The Germans soon met up with the Soviets, at Brest-Litovsk and elsewhere, beginning an uneasy alliance that would last just 22 months. (To their chagrin, they had to abandon some of the territory already won to the Russians, retiring to the pre-arranged boundary line.) Meanwhile, due west of Warsaw, the battle of attrition on the Bzura had reached its inevitable conclusion. Having halted the Polish attacks, the 8. Armee launched its own attack across the river. With the armoured and motorised troops from the 10. Armee rushing up from the south-east and east, and forces from the 4. Armee from Heeresgruppe Nord closing in from the north and north-west, the Germans soon managed to encircle the very considerable Polish forces in a large pocket around the town of Kutno. The battle of annihilation raged for a week but by September 19 it was all over and an estimated 170,000 Polish troops surrendered. However, large fragments of the Poznan and Pomorze Armies managed to break through the German encirclement. Desperately fighting their way through the Kampinos Forest, they succeeded in reaching the Warsaw-Modlin perimeter, mostly around September 19 and 20, considerably reinforcing the latter’s defensive strength. From the Poznan Army came the bulk of the 25th Infantry Division (General Franciszek Alter) and two cavalry brigades (the Wielkopolska under Brigadier-General Roman Abraham and the Podolska under Colonel Leon Strzelecki); 431 survivors of the 14th Cavalry Ulan Regiment under Colonel Edward Godlewski, plus smatterings from three more infantry divisions, the 14th, 17th and 26th. The Pomorze Army brought in 1,500 survivors from the 15th Infantry Division (General Zdzislaw Przyjalkowski), the Pomorze Cavalry Brigade (Colonel Adam Bogoria-Zakrewski) and what little remained of the 4th and 16th Divisions. General Kutrzeba of the Poznan Army, who reached Warsaw on the 16th, was made deputy commander of Warsaw under General Rommel. General Bortnowski of the Pomorze Army had been heavily wounded on the Bzura and was captured on the 21st. Two-thousand men of the 13th Division’s 43rd `Bayonne Legion’ Regiment (Lieutenant-Colonel Franciszek Zbigniew Kubicki), survivors of the rout against the XVI. Armeekorps on September 7, tried to fight their way towards besieged Warsaw, but were stopped by the 11. Infanterie-Division during a night battle in Falenica, a south-eastern suburb of Warsaw, on September 19. As a result, only a few hundred men of the division managed to reach the capital. With these reinforcements – the last to come in – the Polish forces defending Warsaw had risen to approximately 100,000 soldiers. In sub-sector North were the 60th Regiment (25th Division), the 4th Battalion of the 30th Regiment (10th Division), the 59th and 61st Regiments (15th Division) and the 1st Battalion of the 144th Infantry (44th Division) defending Bielany, Mlociny, Zoliborz, Powazki and Kolo, with the 3rd Battalion of the 26th Regiment (5th Division) holding an outer position near Wawrzyszew. In sub-sector West were the 40th Regiment (5th Division) and the 2nd Battalion of the 41st Regiment (29th Division) holding Wola, Ochota and Rakowiec, with the 1st and 5th Battalions of the 360th Regiment and a Volunteer Workers Battalion defending outer positions at Blizne and Gorce Okulicki. In sub-sector South, charged with the defence of Mokotow, Czernieskow and Sierkierki, were a Volunteer Workers Battalion, remnants of the 4th Battalion of the 21st Regiment, the 1st Hunters Battalion and the 2nd and 3rd Battalions of the 360th Regiment. In sub-sector North were the 78th, 79th and 80th Regiments of the 20th Division (Colonel Lawisz-Liszka), with the 1st Battalion of the 43rd Regiment (13th Division) attached, manning positions in Brodno, Pelcowizna and Elsnerow. In sub-sector South (commanded by Colonel Zongollowicz of the 44th Division) were the 26th Regiment (5th Division) defending the easternmost borough of Utrata; Sosabowski’s 21st Regiment (8th Division) guarding Grochow in the south-east, and the two `Defenders of Praga’ Regiments holding Saska Kepa and Goclaw in the south. In general reserve were the 29th Regiment (25th Division), 56th and 62nd Regiments (15th Division), and the three cavalry brigades (the latter now amalgamated into a Combined Cavalry Brigade under Brigadier-General Graham), plus groups of light artillery and a heavy artillery group. After the battle of the Bzura had ended, several of the German divisions from that battle rushed eastwards to tighten the ring around the Warsaw-Modlin perimeter. The XI. Armeekorps – with the 18. Infanterie-Division (Generalmajor Friedrich-Carl Cranz), 24. Infanterie-Division (Generalleutnant Friedrich Olbricht) and 19. Infanterie-Division (Generalleutnant Günther Schwantes) – progressively filled the line on the left of the 31. Division. The Leibstandarte-SS returned to take up positions between Warsaw and Modlin, Hitler having ordained that his elite SS force should be present to take its share of the glory of the upcoming final victory. On the 22nd, the 3. (leichte) Division (Generalmajor Adolf Kuntzen) inserted itself to the right of the 31. Division, along the south side of the perimeter, only to be relieved two days later by two divisions from the XIII. Armeekorps, which had come marching up from the south-west and south: the 10. Infanterie-Division (Generalleutnant Conrad von Cochenhausen) and the 46. Infanterie-Division (Generalleutnant Paul von Hase). This entry was posted in Germany, Poland, Siege by MSW. Bookmark the permalink.